Preheat oven to 350°F. In a large bowl or stand mixer, beat together flour, butter, egg, lemon zest and brown sugar until smooth. Add granola and mix well. 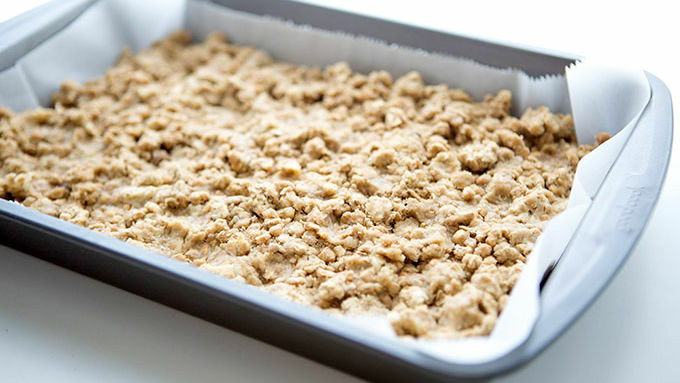 Press 3/4 of the mixture into the bottom of a 9 x 13 parchment-lined baking dish. In a large bowl, stir together jam, blueberries, cornstarch, honey and lemon juice from one lemon. Spread this mixture on top of the granola. 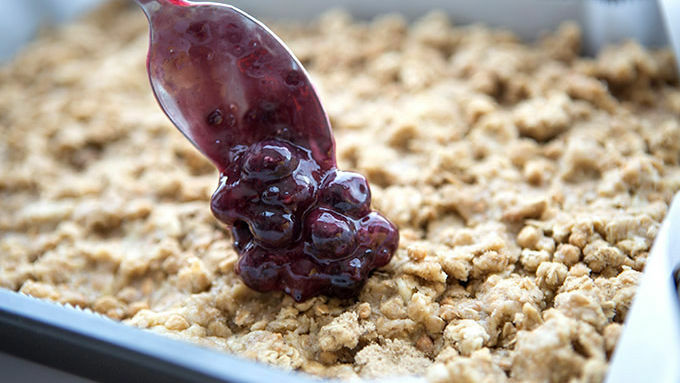 Sprinkle remaining granola mixture across the top. Bake for 40-45 minutes, or until the edges begin to turn a light golden brown. Cool completely before slicing. Place warm pan in fridge to expedite cooling. When it comes to breakfast, there’s some pretty standard fare. French toast, pancakes, oatmeal, cereal. Fine options for most days, I suppose. But what about those days when you wake up and the same-old everyday standard just won’t cut it? 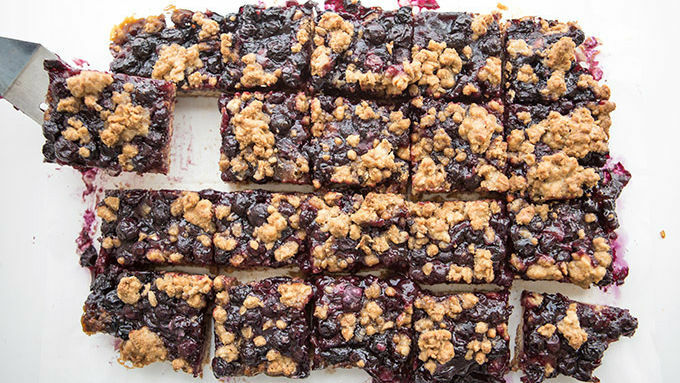 Well, on those days, you make a batch of protein-granola Blueberry Crumble Breakfast Bars. With a crunchy granola crust, organic jam and blueberry filling, and golden granola streusel topping, these lightly sweetened bars are an ideal make-ahead breakfast or easy brunch nom. I like cutting the bars into 5 rows on the long side of the pan and 4 rows on the short. Hello there, little blueberry bars. These beautiful squares are ready to serve, share or wrap for lunchboxes. They’re great for just about every morning thing ever—and they pair ever so nicely with a cup of coffee and side of bacon.